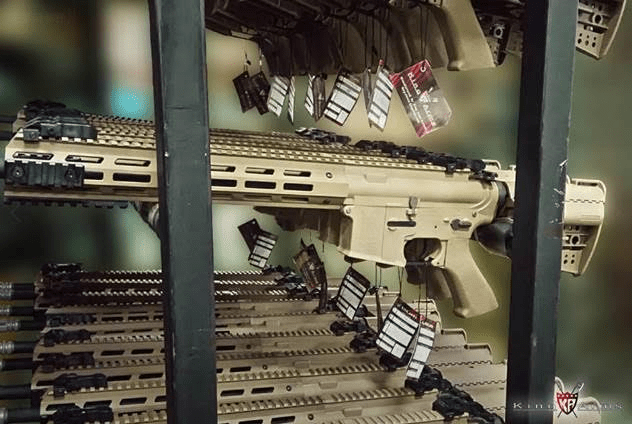 140 Rds Training Weapon System (TWS) TMAG for M4 / Black Rain Ordnance/ M-LOK Series. 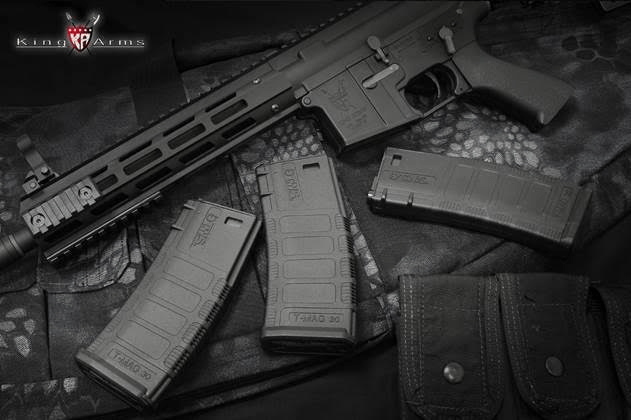 Non-slip texture polymer casing ensures the operator access the magazine confidently. Review !! 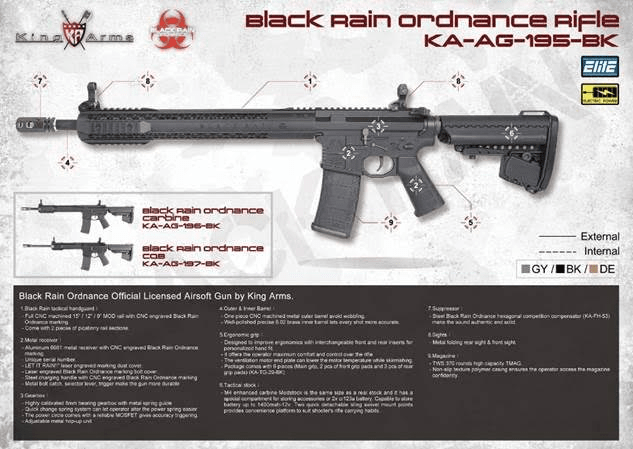 Black Rain Ordnance Official Licensed Airsoft Gun by King Arms. 1.Full CNC machined 15"/ 12"/ 9" MOD rail with CNC engraved Black Rain Ordnance marking. Come with 2 pieces of picatinny rail sections. 2.Aluminum 6061 metal receiver with CNC engraved Black Rain Ordnance marking. 3. Quick change spring system can let operator alter the power spring easier. 4. Well-polished precise 6.02 brass inner barrel lets every shot more accurate. 5.Designed to improve ergonomics with interchangeable front and rear inserts for personalized hand fit. 6.M4 enhanced carbine Modstock is the same size as a real stock and it has a special compartment for storing accessories or 2x cr123a battery. Capable to store battery up to 1400mah-12v. Two quick detachable sling swivel mount points provides convenience platform to suit shooter’s rifle carrying habits. 7.Steel Black Rain Ordnance hexagonal competition compensator (KA-FH-53) make the sound authentic and solid. 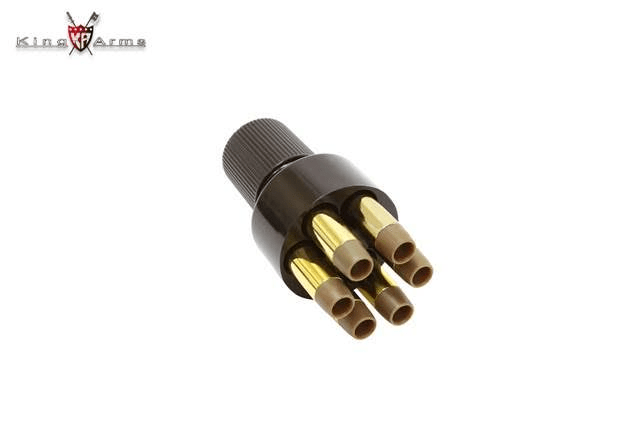 8.TWS 370 rounds high capacity TMAG. 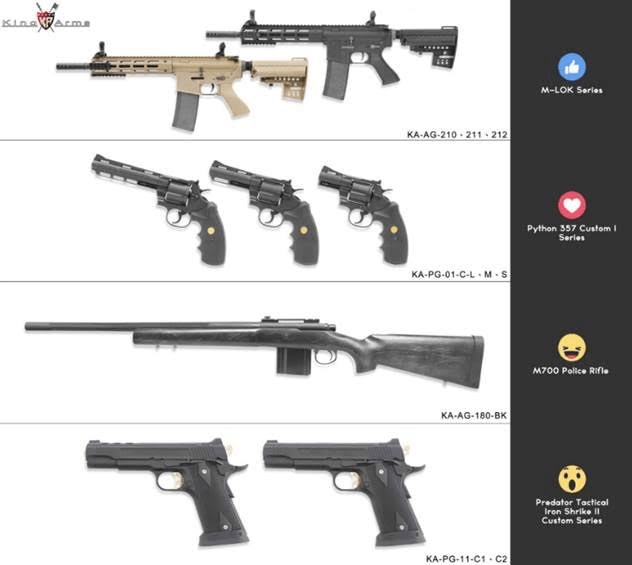 Have you guys decided to choose which KA new products as your weapon?? Please vote what you expect the most. Heavy brass-like finishing shells with high compression rubber bb retainers. This BB loader can fast reloads 6 BB bullets shells.